One Knox County school board member described the Tennessee Department of Education as an “abject failure” when it comes to measuring student outcomes and teacher effectiveness while another suggested there was “plenty of incompetence” to go around at the Department. Sandra Clark in KnoxTNToday.com reported on a School Board meeting in which board members expressed frustration with the Tennessee Department of Education’s implementation of Pre-K and Kindergarten portfolios. According to Clark’s story, members of the Knox County School Board directed Director of Schools Bob Thomas to send a strongly-worded letter to Commissioner McQueen about the problems with this year’s portfolio evaluation. The Knox County meeting came as the DOE was putting out information casting blame on teachers for the portfolio problems. While the state DOE repeatedly misses deadlines and frequently changes portfolio and testing vendors due to a range of issues, whenever a problem occurs with testing or evaluation, everyone is to blame EXCEPT leaders at the Department. Of course, teachers will be trained — but the training will happen during the school year and be on the teacher’s own time. Regional Teacher Trainings for Early Grades Portfolios Fall 2018 Fall trainings will provide teachers an opportunity to network and learn more about the portfolio platform, purposeful sampling, and developmentally-appropriate use of scoring rubrics. To support teachers in developing in-depth, conceptual understanding of math standards, this guidance document will highlight the standards and scoring rubrics included in the early grades portfolios. Yes, you read that correctly — the Math Standards Guidance Document will be available sometime in Spring 2019. That’s after the teachers have had students in class for months and well after the recommended time for collecting evidence for “Point A” of a portfolio. Also, while it sounds nice that DOE is offering this (uncompensated) training, it should be pointed out that the portfolio is moving to a new platform AND that the DOE has a track record of missing deadlines. Will teachers receive relevant, useful training in time to actually help them meet portfolio requirements? Unfortunately, that’s unclear. The evidence from this past year suggests that answer is NO. Knox County School Board Vice-Chair Amber Rountree recently sent out this message addressed to all Tennessee teachers. The letter comes as the state both celebrates some TNReady scores and grapples with the latest round of TNReady troubles. It’s an interesting contrast to the letter sent to educators who are having their evaluation scores adjusted due to TVAAS errors this year. Then I moved onto 4th grade, where the students were engaged in writing thank you notes to several donors who made a field trip possible earlier in the week. The smile a student gave when she got to show me her note and her beautiful cursive could have lit up the entire room! Next I visited 3rd grade, and helped work with a small group on constructing a response based on the story they had been studying about penguins. They were able to remember key facts from the text and transform what they learned in their own words. Finally, I wrapped up my visit by talking with the principal about her to desire to apply for a Read to Be Ready grant for her school for the upcoming summer. She spoke about using her lunch hour to have a book club with her students at the nearby park. I have been honored to work as an educator in Knox County, to serve on the Board of Education, and to currently continue my education as a doctoral student at the University of Tennessee. You might say I have the inside track on the amazing things happening in our schools, but most aren’t lucky enough to have this experience and are relegated to reading about it in the local paper. Perhaps the TDOE missed the irony in the reporting of TNReady errors immediately prior to unfurling banners celebrating schools who have improved based on said assessment. There is no reason to celebrate an assessment that lacks validity because the data from TNReady is incomparable to TCAP. Here’s what we should celebrate: the SRO who received a thank you note from a student, the chorus teacher finding a place for every student in the musical, the child who wouldn’t pick up a book last year and can’t put one down this year, the innovative library with a student run coffee shop, the teacher using an outdoor classroom to teach science, and you. You are in each of these stories and I am grateful. I hope no matter what label the Department of Ed applied to your school, you are proud of the work you do daily to help grow your students. The Tennessee State Board of Education meets on Thursday, December 15th via conference call to discuss the A-F school grading system and to take action on high school policy, specifically as it relates to grading. The high school policy includes a proposed change to the way End of Course tests are factored in to student grades — which is pretty important, since the semester is ending very soon and high school students on block schedules will be finishing courses in the next few days. The EOC grade policy is noteworthy as two of the largest school districts in the state (Nashville and Knox County) have passed resolutions asking the state NOT to count any TNReady test in student grades or teacher evaluations for the 2016-17 academic year. Results of individual student performance from all administered End of Course examinations will be provided in a timely fashion to facilitate the inclusion of these results as part of the student’s grade. Each LEA must establish a local board policy that details the methodology used and the required weighting for incorporating student scores on EOC examinations into final course grades. If an LEA does not receive its students’ End of Course examination scores at least five (5) instructional days before the scheduled end of the course, then the LEA may choose not to include its students’ End of Course examination scores in the students’ final course grade. The weight of the EOC examination on the student’s final average shall be ten percent (10%) in the 2016-2017 school year, fifteen percent (15%) in the 2017-2018 school year; and shall be determined by the local board from a range of no less than fifteen (15%) and no more than twenty-five (25%) in the 2018-2019 school year and thereafter. Note, the 2016-17 academic year is happening right now. Students have already taken these EOC exams and their semesters will be ending soon. But, the policy change won’t happen until Thursday, assuming it passes. Alternatively, the State Board of Education could be responsive to the concerns expressed by the school boards in Nashville and Knoxville and prevent this year’s EOC exams from impacting student grades. On Monday, the Knox County School Board will discuss and possibly vote on a contract extension for embattled Director of Schools Jim McIntyre. Last night, teachers, parents, and students packed the Board meeting room and some asked the Board not to renew McIntyre’s contract. It’s not clear from available news reports that anyone was present to ask the Board to extend the contract. McIntyre has come under fire for being an enthusiastic supporter of state-level policy changes to teacher evaluation and for not listening to the concerns of parents and teachers regarding what they call excessive testing and over-reliance on test-based data to evaluate teachers. That said, the Board recently announced they are working on a resolution calling for more transparency in the TVAAS system used to create scores for teacher evaluation. Monday’s meeting, focused on the contract extension for McIntyre, will also likely be a contentious one, though it’s not clear whether a significant number of Board members would consider non-renewing the contract. 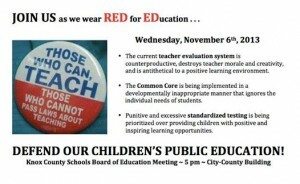 Another contentious School Board meeting in Knox County tonight. A Knox County high school student addresses his School Board on Common Core and teacher evaluation. His remarks underscore the reality that education is a people business and thus, not easily quantified. 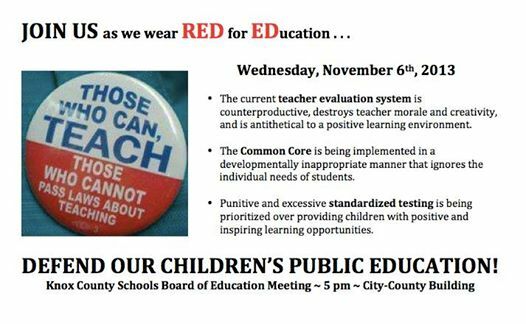 As a follow-up to Knox County teacher Lauren Hopson’s address to the School Board, a group of Knox County teachers plan to attend tonight’s Board meeting at 5PM and wear red to show their support for the key points she made — that students are subjected to too much testing, that teacher evaluation using TVAAS data is unfair because it is unreliable, that using student surveys like TRIPOD to evaluate teachers (a controversial issue in Metro Nashville as well) is inappropriate.